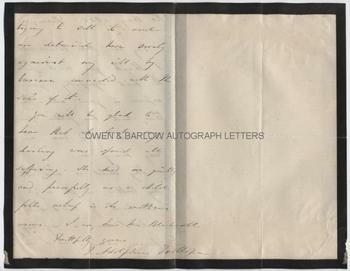 THOMAS ADOLPHUS TROLLOPE Autograph Letter Signed. British (English) novelist, journalist and traveller. Elder brother of Anthony Trollope. ALS. 2pp. Florence. 20th May 1865. To Miss [Anna] Blackwell. 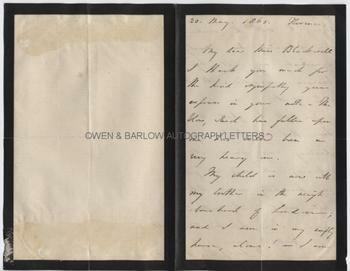 "I thank you much for the kind sympathy you express in your note. The blow which has fallen upon me has indeed been a heavy one. My child is now with my brother in the neighbourhood of London and I am in my empty house, alone! I am trying to sell it; and am detained here sorely against my will by business connected with the sale of it. You will be glad to hear that at least my darling was spared all suffering. She died quietly and peacefully as a child falls asleep in its mother's arms. 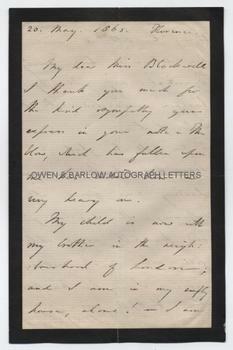 I am, dear Miss Blackwell, faithfully yours, T. Adolphus Trollope." 8vo. Approx 8.25 x 5.25 inches. Short tear along fold line at foot. Mounting traces to verso. All else near fine. Thomas Adolphus Trollope was a prolific writer who published several novels and over 60 works on travel, history and biography. He settled in Florence, where he spent many years and his house became the great gathering place for the Brownings, Dickens, George Eliot and many other English writers visiting Italy. In addition to his novels and other books, he was a contributor to Charles Dickens' 'Household Words' and other periodicals. Thomas Adolphus Trollope quickly became one of the most prolific writers of his day and was widely read and admired. In 1865 his wife, Theodosia Garrow, died and he was forced to sell the house they had bought together and move to the Villa Ricorboli, where in 1866 he married his second wife, the novelist Frances Trollope nee Ternan. Anna Blackwell (1816-1900) was the elder sister of Elizabeth Blackwell, the first woman to gain a medical degree and the first to be registered as a medical practitioner. Anna Blackwell had founded a school in America with her sisters but gave this up to pursue a career as a poet, translator and journalist. She settled in France, where she translated the works of the French socialist, Fourier, and the novels of George Sand. She wrote weekly columns for newspapers and journals in America, Canada and elsewhere. Provenance: From a 19th century album compiled by the Blyth family. Edward Blyth was a London solicitor who was a friend and advisor to Elizabeth Blackwell and her family.